I’m a strong believer in my personal privacy. I post pics of my kids on my social media, but never on my blog because while I choose to write about my life, I also respect that they do not choose to do that, so I don’t post their names or photos. My number one pet peeve in life is those parents who post literally every personal milestone of their kids lives (photos of them on the potty, telling stories of them smearing poop on the walls) on social media. I try to limit stories about my kids to when they are doing hilarious things. Adversely, I blog about my personal life, as I write to sort through my own feelings. I’ve been through a lot when it comes to my interpersonal relationships and I know I still have some growing to do, I still need to learn to trust better and I need to stop fearing the idea of a legally binding lifetime commitment because fear only holds us back from truly being happy. Writing about it helps me find my way. But I never post it on social media (that’s not true, there are TWO photos on my Instagram). There was a random mention of my significant other on my Facebook on my birthday, when I excitedly wanted to show off his adorably thoughtful present to me. When I first moved here, I was beyond excited to find penguins in the West Edmonton Mall, as penguins are the most awesome animals on the planet. 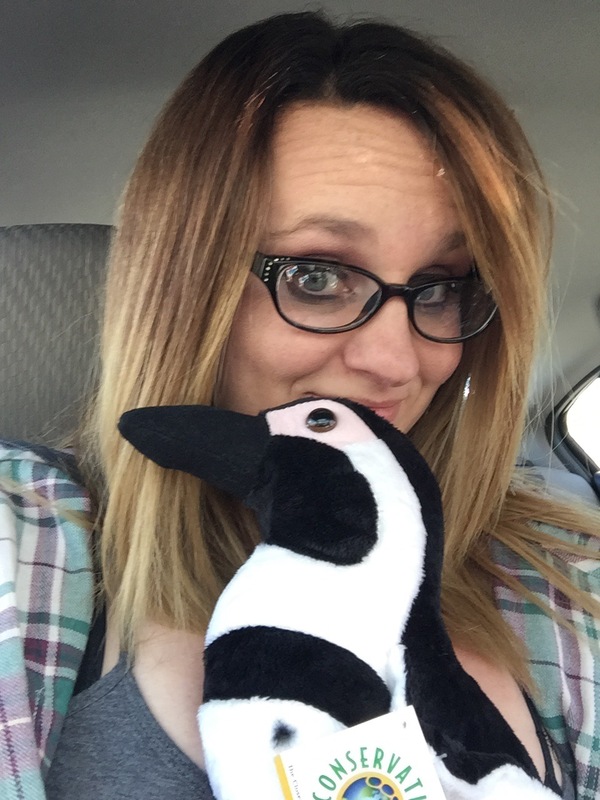 One night, when I was dreadfully homesick, he sent me a text message, telling me that I would adjust, it would be okay, he loved me so and he would do whatever it took to help me feel at home here, including find me a penguin to be my pet. My penguin may be cuddly and stuffed, but the gesture was very sweet, and now my penguin sleeps with me at night (judge me, I don’t care). I had a couple of people ask me about my significant other and overcthe past few months, some of my closest friends challenged me on my comfort level about my relationship because I never mention it online. But it’s not for a lack of faith in my romantic life that keeps me mum on the details of my romance online or to the masses, it’s quite the opposite; I keep it mine because it’s mine. It’s not a secret who I am dating. My friends and family know who I’m seeing and his friends and family know as well. But the seriousness, the depth of our commitment, the things that are personal are not for public domain. Obviously my closest friends are in the know (So Erica, Melissa and the Gleason Table), but I really don’t feel that the general population needs to know the ins and outs of my love life. That is mine. It’s a part of my life that is very important to me, much like my career and my children. Obviously, I wouldn’t post my job satisfaction on the internet, or personal things about my children, so why would I post things about my love life on the Book of Face? I used to, but I also see that before I was VERY insecure about my relationship. I was always afraid the relationship would fall apart, so I thought if I said I was happy, then I would convince myself I had nothing to worry about. I see now that was actually stupid. I was inviting the peanut gallery into my relationship. That brought about mistrust, which combined with my insecurities and his fear of long term commitment (and mine) prompted the relationship to implode. I see people all the time on FB talking about people poking into their relationships and telling their friends/family to mind their own business and I often think, then don’t constantly put your business out there with memes and statuses and stuff. But, during the evolution of MHC, I realized that in order to be a decent partner, things needed to change. One of the things that needed to change was my reliance on the acceptance of others. It doesn’t matter if my friends like my boyfriend; I am in love with him. It doesn’t matter if he posts a million cutesy things on Facebook, in fact, we rarely interact on social media. We communicate away from social media. We talk, we text, we cuddle. I learned that to keep a relationship healthy, you need to keep your relationship in house. Facebook does not need to know that I love my boyfriend: he does. 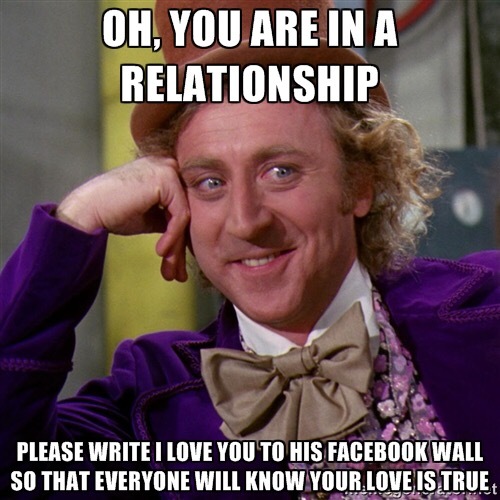 Every time I see these over the top FB declarations of love or passive aggressive statuses or the constant switch from “single” to “it’s complicated” to “in a relationship.” Yuck. Why do you need to convince the planet you’re in love? There are exceptions to every rule. I have some friends that post the odd cute photo & they radiate love & you feel happy for them. My two favourite coaches at my old gym are those people. My friends Nic & Sarah as well. But again, these are vacation photos, rare snippets in time. Not an all out assault of “LOOK HOW IN LOVE WE ARE.” They are sharing small snippets of their lives, which is the point of social media. It’s about small pieces of your life, but the story is for you alone. Sometimes I think about how people like Blake Lively & Ryan Reynolds recently had to cut a friend out of their lives to protect daughter James’s privacy. Jennifer Aniston & Justin Theroux had to hide their wedding plans & take their guests cell phones to protect their privacy. WWE interviewer Renee Young put fans on blast because a harmless photo of her & fellow broadcaster Corey Graves taken on her birthday was misconstrued, followed by insulting comments asking about the whereabouts of her longtime boyfriend, WWE Superstar Dean Ambrose. She chooses to keep their relationship private, and fans get angry that she isn’t sharing photos. All these people want is to enjoy their private moments. Then we regular folks abuse the very same privacy by putting it all out there to be analyzed & get angry when people do. Maybe someday I’ll feel comfortable sharing snapshots of my life. Maybe not. But until I reach that place, I choose to protect my personal life & my children’s privacy. You do not need to know when my child used the bathroom. You do not need to know the intimate details of my personal life. 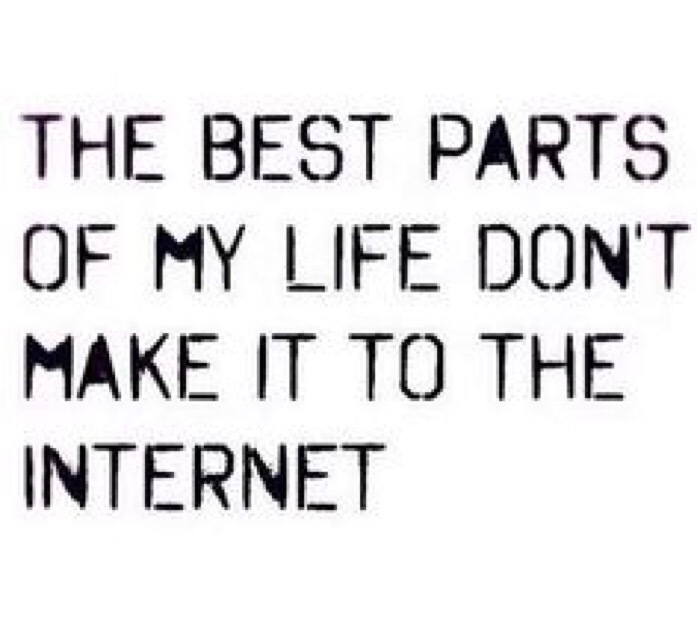 But the little bits I do share, I enjoy sharing with you, as I enjoy those rare snapshots of your life as well.